Otzma Yehudit party claims repeated arson attacks on victims of deadly Duma arson prove murder was not carried out by Jewish extremists. Last night (Thursday), the Dawabsha family home was set on fire in the village of Duma in the area of Nablus (Shechem). According to reports, this is not the first time a house belonging to the Dawabsha clan has been set on fire in the Arab village. The Palestinian News Agency reported that unknown persons threw Molotov cocktails into the house after breaking its windows. The neighbors extinguished the fire and there were no casualties. Three members of the Dawabsha family were killed in 2015 when Molotov cocktails were allegedly thrown at two houses in Duma. The firebombs caused a fire to break out. Sa'ad and Riham Dawabshe and their son, 18-month-old Ali Dawabshe, were killed in the fire. 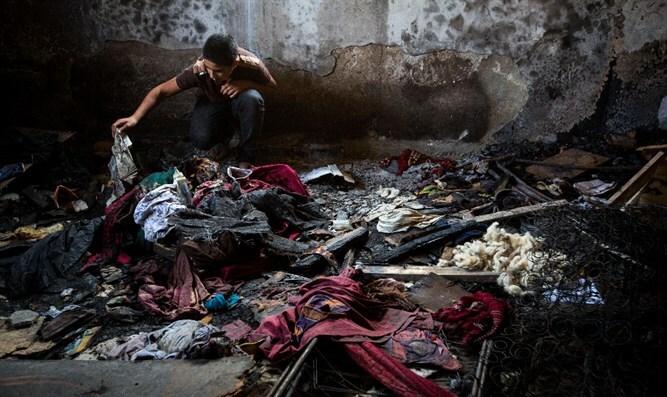 Activists from the 'Otzma Yehudit' organization claimed that last night's arson proves that the murder of the Dawabsha family three years ago was nothing more than the "settling of internal accounts" and not the act of Jewish extremists as the government claims. The movement added: "The arson of this house joins the burning of the homes of Manor, Ibrahim, and Muhammad Raki, which have been torched since the arson and the murder of Abdul. All of them were from the Dawabshe family." "It should be emphasized that two of the characters whose houses were torched are eyewitnesses in the case, and another house belongs to the brother of the young man whose house was burned by the famous arson,"
"The line of arson even when (Jewish suspects) Ben Uliel and the minor in the prison proves finally the claims that the murder in Duma is the liquidation of internal accounts," added the movement.